Betina and her son Elvin. Betina was in a coma virtually her entire pregnancy. Doctors in Kottayam, India, were left speechless—and understandably so. Last January, a woman described only as Betina had arrived at Caritas Hospital “half dead” after a nasty fall left her with a severe brain injury. “The rate of her heart beat plunged to just 23% and she couldn’t breathe in oxygen as her lungs were swollen,” reported A.S. Ullas of the Indian news site Manorama Online. She was left in a coma. And if those weren’t enough complications, no sooner had doctors told the family they could not do anything more than her husband, Anoop, told Dr. Vivek of the emergency medical department that his wife was pregnant! The medical team sprung into action but were unable to immediately stabilize Betina’s condition. 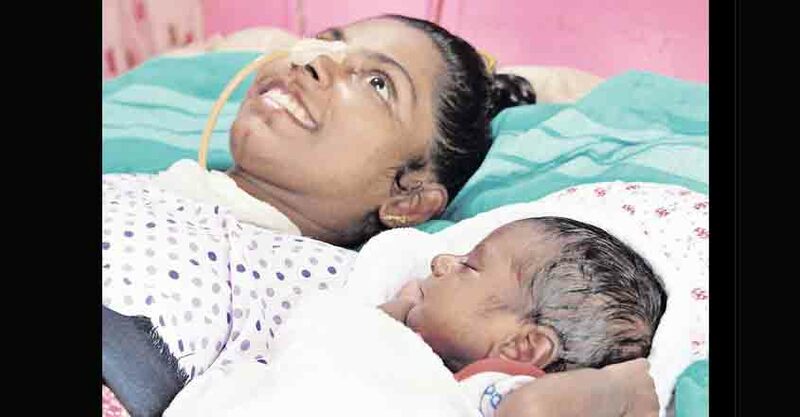 According to Ullas, given the strong medicines Betina was on and the baby’s low heartbeat, they doubted her nine-week-old unborn baby boy would survive. An abortion was planned and Betina was moved to Kottayam Medical College. “The doctors at the medical college, however, said the foetus would be aborted naturally, and a medical procedure could put the mother’s life at further risk,” Ullas reported. By the time of her scan at 11 weeks, Betina “had contracted severe infections many times,” Ullas reported. But miraculously, through all this, the baby had grown normally and his heartbeat had increased significantly. There were more complications, Ullas reported—at one point, the baby’s right hand was not found during a scanning—and again the issue of an abortion was raised. Betina’s baby boy (later christened Elvin) was delivered at 37 week on June 14. And then an even more miraculous development. “Hearing the soft little cries of her newborn child, there was a slight movement in Betina’s eyes. When the baby was laid beside her, Betina’s eyes were filled with tears and [she] tried to move her hands to touch her child. After two weeks of medical observation in the neonatal ward, baby Elvin was shifted to his mother’s room. The cries and laughs of the baby became Betina’s medicine. Tip of the cap to Life News.